Automotive Technology is a two-year program designed to provide students with basic mechanical knowledge and skills. As an Automotive Service Excellence (ASE) program certified by the National Automotive Technicians Education Foundation (NATEF), students gain knowledge and skills through a combination of theoretical study and hands-on lab work, including the repair of customer vehicles in brake systems, engine performance diagnosis, suspension and steering, electronic control systems, and on-board computerized engine control systems diagnosis on automobiles and light trucks. 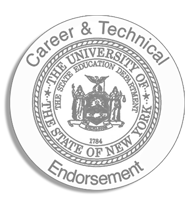 This program, which is state and nationally certified, is the first step in preparing an individual for a career in the technical repair field. Over the course of the program, students are provided with internship experiences and the opportunity to earn a Career and Technical Endorsement on their diploma by successfully passing the industry-standard ASE NATEF technical assessment. In addition to automotive technology classrooms at the Thompson Road Campus in Syracuse and the Cortlandville Campus in Cortland, OCM BOCES has an automotive technology classroom embedded at the Driver's Village Used Car Warehouse in Cicero, NY. Click the links below to download brochures specific to each classroom. according to the U.S. Bureau of Labor Statistics.